This blog post is part of a series that discusses how to get optimal performance from PeopleSoft nVision reporting as used in General Ledger. 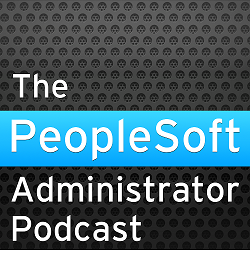 It is a PeopleSoft specific version of a posting on my Oracle blog. As I explained earlier in this series, it is not possible to add hints to nVision. The dynamic nature of the nVision SQL means that it is not possible to use SQL Patches. nVision SQL statements contain literal values and never use bind variables. When dynamic selectors are used, the SELECTOR_NUM will be different for every execution. A SQL_ID found in one report will be not be seen again in another report. Even static selector numbers will change after the tree is updated or when a new tree is created. It is possible to use SQL Profiles to introduce hints because they can optionally match the force match signature of a SQL. SQL statements that differ only in the literal values they contain will have different SQL IDs but will have the same force matching signature. Although you will still have a lot of force matching signatures, you should find that you have far fewer force matching signatures than SQL_IDs. Picking out the signatures that account for the most elapsed execution time and creating profiles for them is manageable. Note: SQL Profiles require the Tuning Pack to be licenced. As far as is possible, good nVision performance should be achieved by setting appropriate tree performance options at tree level. These are global settings. You may find that a particular setting on a particular tree is not optimal for all reports. You may then choose to override the tree-level setting in specific layouts. You may also find that you still need hints to control execution plans. In particular, parallel query can be an effective tactic in nVision performance tuning. However, you should put a degree of parallelism on PS_LEDGER or PS_LEDGER_BUDG because that will invoke parallelism in many other processes. I have found that even putting a degree of parallelism on a summary ledger table can easily result in too many concurrent parallel queries. On OLTP systems, such as PeopleSoft, I recommend that parallelism should be used sparingly and in a highly controlled and targetted fashion. Let's take the following nVision query as an example. We can tell from the equality join conditions that the two selectors still joined to the are dynamic selectors. A third selector on DEPTID has been suppressed with the 'use literal values' performance option. The number of DEPTID predicates in the statement will depend on the tree and the node selected for the report. Note, that if these change then the statement will not force match the same profile. SQL profiles might suddenly cease to work due to a tree or selection criteria change. This is the plan I get initially and without a profile. It doesn't perform well. These are the hints I want to introduce (on Oracle 12c). Use automatic parallel degree, statement queuing and in-memory parallel execution. Use a Bloom filter when joining to the materialized view. I have created a data-driven framework to create the profiles. I have created working storage table to hold details of each force matching signature for which I want to create a profile. Using conditional parallelism with the PARALLEL_MIN_TIME_THRESHOLD, but limited with PARALLEL_DEGREE_LIMIT is an effective tactic with nVision, so I have specified columns in the metadata table for those hints, otherwise, hints are injected via a string. I identified the problematic SQL by analysis with ASH, and hence I also obtained the FORCE_MATCHING_SIGNATURE. The metadata is keyed by FORCE_MATCHING_SIGNATURE. I have specified a meaningful name for the SQL profile. Profiles are created using the text of a SQL rather than the SQL_ID or FORCE_MATCHING_SIGNATURE directly. Therefore the SQL_TEXT must be extracted from the AWR, so this method also requires that the SQL statement has been captured by an AWR snapshot. Columns REPORT_ID and TREE_LIST contain application specific information extracted from the application instrumentation and tree selector logging. Now I can produce a simple report of the metadata in order to see what profiles should be created. Next, this PL/SQL block will create or recreate SQL profiles from the metadata. The various hints can be concatenated into a single string and passed as a parameter to SQLPROF_ATTR. The SQL text is passed as a parameter when the profile is created. And now when the application runs, I get the plan that I wanted. The query runs in parallel. The SQL is rewritten to use materialized view. There are no indexes on the materialized view, so it must full scan it. It generates a bloom filter from PSTREESELECT10 and applies it to the materialized view. Profiles can be used in much the same way as SQL Patches to introduce hints into application SQL without changing the code, the difference being that SQL Profiles can force match SQL. However, SQL Profiles do require the Tuning pack to be licenced, whereas SQL Patches and Baselines do not. Applying force matching SQL profiles to nVision is an effective, though reactive tactic. Tree changes can result in changes to the number of literal criteria in nVision SQL statements that may, therefore, cease to match existing profiles. nVision will always require on-going monitoring and introduction of new profiles.